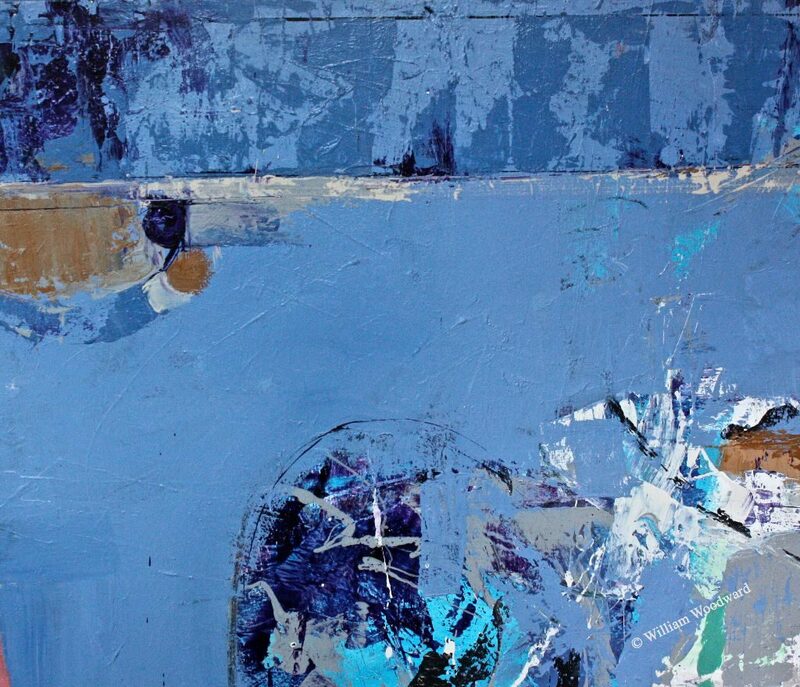 The Byrne Gallery is proud to present Between Sea and Sky, a celebration of summer! This eight-week exhibition lasts through July and features paintings by four unique artists. 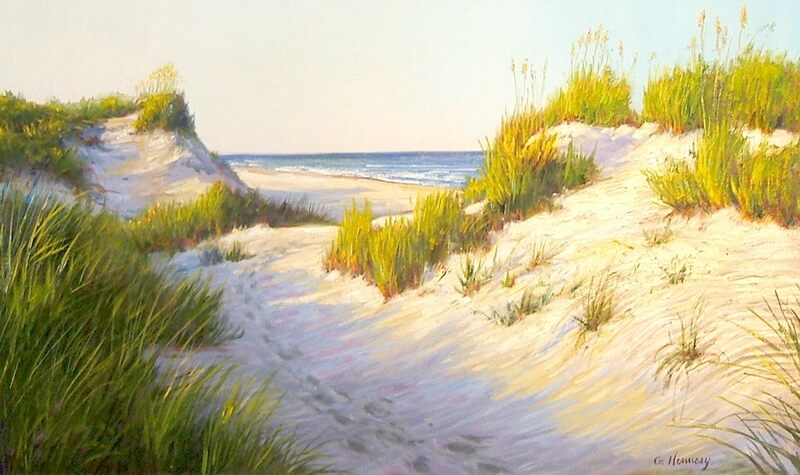 There are beautiful ocean paintings in oil on linen by Gerald Hennesy, whose powerful waves and dune-scapes will make you long for the seaside. 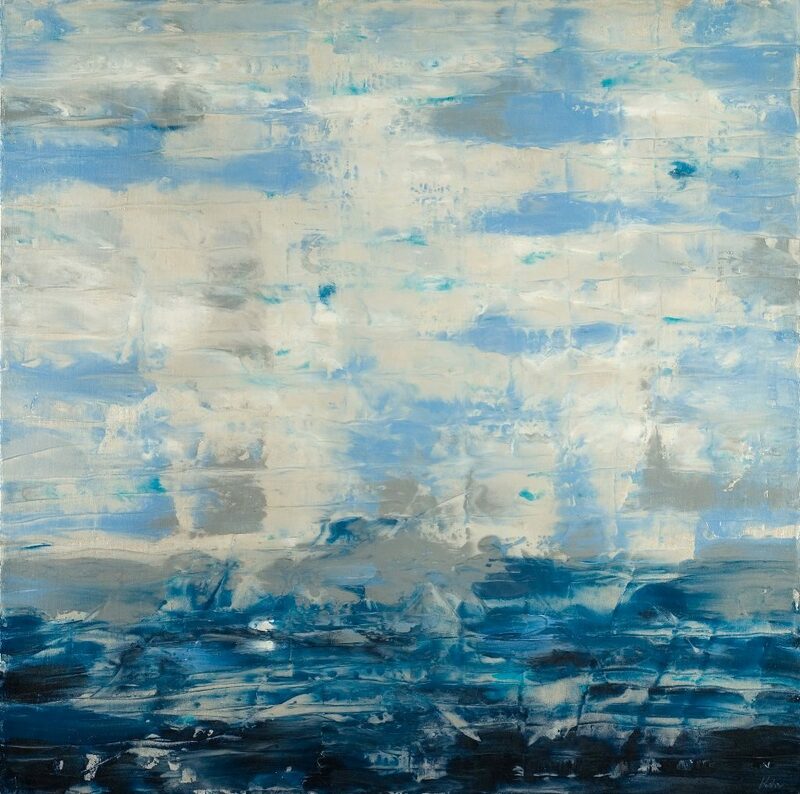 Abstract sea and skyscapes by Gwyn Kohr will relax you the minute you see them and your imagination will bring you to the ocean’s edge. 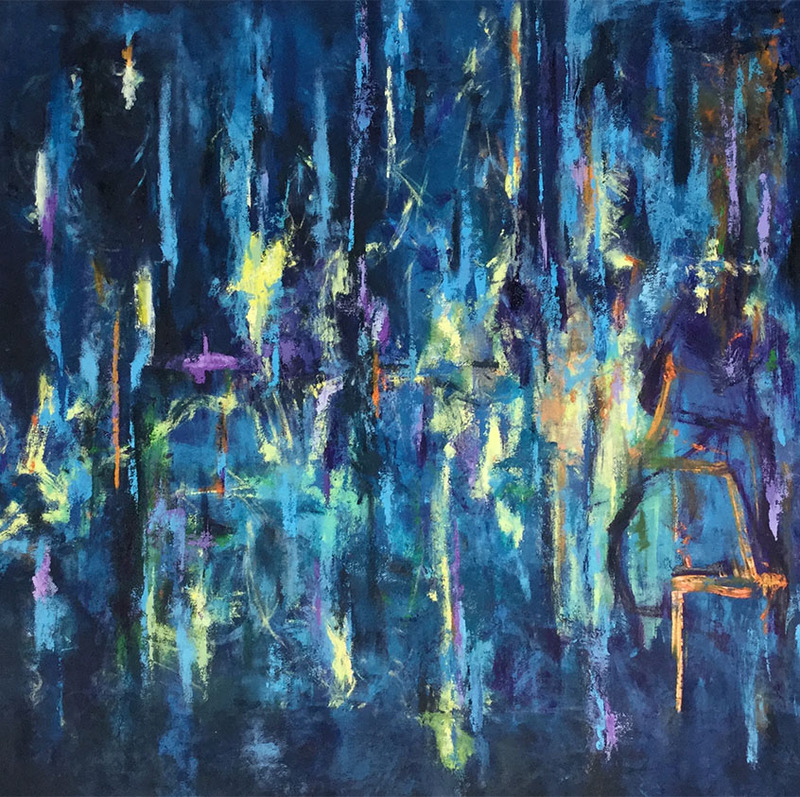 Cathie Meighan’s use of color is extremely moving and the blues and greens of summer that she uses so deftly will make you cherish this lovely season the whole year long. William Woodward brings exotic sea locations to the Gallery will his abstract renderings of Atlantis and Poseidon. Hennesy is a master painter known throughout Virginia and the coastal waters of the eastern seaboard. His paintings of the Atlantic ocean are some of the finest you will ever see. 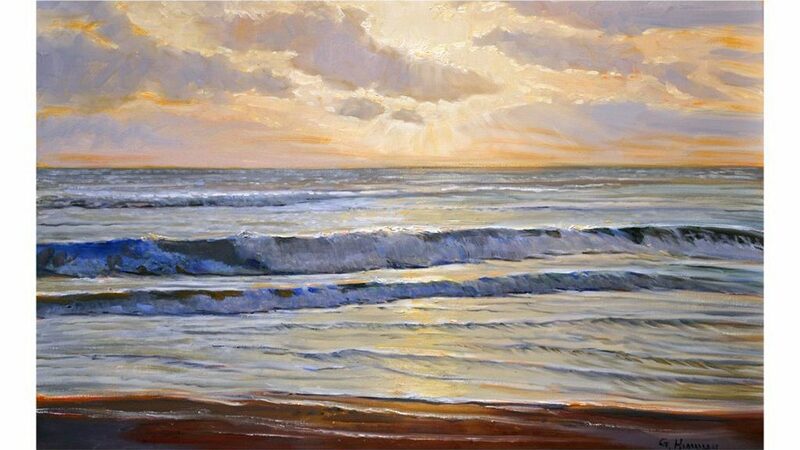 His painterly impressions of the sea at dawn will thrill you with the majesty of this powerful body of water. He paints primarily in oil in an impressionistic style, working both in plein-air and in his studio. It is important that a subject chosen for a painting be exciting to him, so it will then also be exciting and interesting to the viewers of his completed piece. Once a scene has been selected and the composition sketched in, Gerald paints rather rapidly, while attempting to achieve a freshness of color and expressiveness in his brushwork. He is particularly concerned with depicting the effect of light on his landscape and seascape subjects. His work has been exhibited widely in commercial and museum galleries including the Baltimore Museum of Art, the Georgia Museum of Art, The Corcoran Museum of Art and the Smithsonian Museum. His paintings are in numerous private, corporate and public collections, including the U. S. House of Representatives, the State Department, the Maryland State Mansion, the DAR Headquarters, and the American Legion Headquarters. He is listed in Who’s Who in America and Who’s Who in American Art. Gwyn Kohr received her fine art degree from California State University. She taught and exhibited extensively in California before moving to Virginia in 2004. Here she has continued her artistic explorations showing with the Byrne Gallery and other galleries in the area as well as in Rehoboth Beach, Delaware. She creates textural paintings that are evocative of nature. Within the fluid space of each painting she achieves a balance and integration between form and non-form, abstraction and representation. Cathie Meighan is a Philadelphia-based abstract Expressionist painter whose art is built on intuition and the spiritual. Her art is not preconceived but created from an evolutionary process that relies heavily on an interior movement and the sixth sense. Her artistic response from what emerges in a painting is what gives expression and meaning that can only develop through deep connection between the painting and the creative process. Her work evolves out of what is considers to be a choreographed dance. The paint and the marks lead her through an inner movement, which demands a response, as it directs and awakens the unconscious in each painting. William Woodward, a third-generation native Washingtonian, is among America’s most sought-after and admired classically trained painters (the Florentine Academia di Belli Arti, the Corcoran School of Fine Art, and American University.) The recipients of multiple awards and commissions, Woodward’s works have frequently been acquired by museums, as well as scores of corporate, public and private collections. Woodward, as director of George Washington University’s MFA program in Studio Arts for more than thirty years, has mentored three generations of artists in the techniques of the great masters, and is a frequent guest speaker at prestigious venues such as the National Gallery of Art in Washington, D.C.